>You can follow this Blog on Facebook and Twitter, Become a Fan and Follower Today! 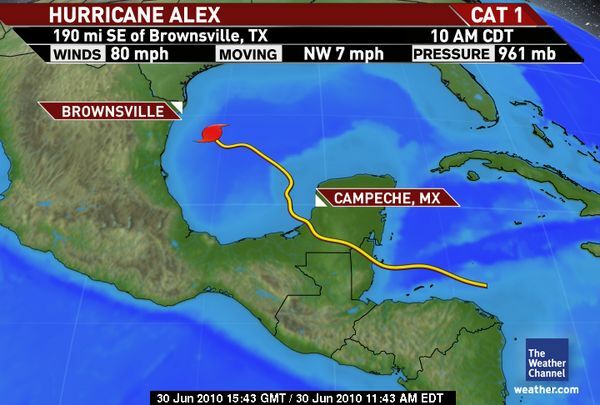 Special Early Editon Blog with Updates and Coverage of Hurricane Alex’s Mexican landfall starting at 6am GMT tomorrow….. A special Hurricane Alex Video blog will be recorded by Mark Vogan tomorrow morning on the Facebook Fanpage…. NOW A 90-MPH HURRICANE AIMING FOR LA PESCO, MEXICO, EXPECTED TO MAKE LANDFALL LATE TONIGHT EASTERN TIME…. Hurricane Alex is expected tonight to make a northeast Mexico landfall sometime near Midnight ET as a Category 2 storm as the system continues to organise and intensify within it’s inner core over the very warm waters of the western Gulf of Mexico, waters are around 85-86 degrees and the upper atmospheric environment is very conducive for further intensification over the next 12-hour time window before it reaches land. Alex’s central pressure is currently at 961mb with maximum sustained winds at 80mph, usually when pressures drop like we’ve seen, wind speeds sometimes take some time after the pressure drop to respond. 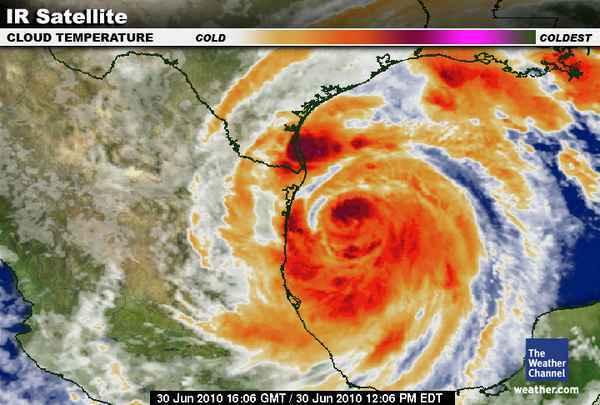 It looks likely that this storm will have winds sustained at around 100 to 105mph by the time the eye reaches the northeast Mexican coast, thankfully, the area at which the storm will cross is fairly low in population and a remote area of Mexico between Matamoros and Santander which is inland…. LANDFALL REGION INFO: COMING SOON! A hot a typical day in the last day of June with highs around 107 and lows around 80 for Las Vegas, hi’s around 110 and lows around 85 for Phoenix and indeed 115+ degrees for Death Valley. As usual the coast will see morning fog and low cloud with lows around 60, whilst burn arrives by late morning/early afternoon, sea breeze kicks in with highs around 70-75 degrees for the coast, 80 for downtown LA down to San Diego and 90s to low 100s for inland empire and other inland valleys and basins. As for the northwest, it’s cool along the coast with 50s and 60s at the beaches to cities of Seattle and Tacoma, near 75 for Portland, whilst east of the mountains it ‘s near 80s for eastern WA and OR.. Montana should see highs top around 90 for Billings with a chance of PM storms. A hot, sunny day from Salt Lake down to Denver with highs in the mid-90s! A day which see a final return to normal across the entire Southeast, strong storms run onshore along the Gulf Coast as a result of Alex’s outer bands, this is holding highs to the mid-80s for New Orleans to Pensacola today whilst inland the same story as a cold front has pushed temps down to also the mid to upper 80s from Shreveport to Atlanta with a 40 to 50% chance of thunderstorms. Lows are in the low 70s for the interior of the region, upper 70s nearer the Gulf coast. A stunningly beautiful and sunny day across the entire Northeast after the brutally hot days and nights of recent days. The front has completely cleaned out the Northeast airspace and held highs today near 80 degrees in Washington and remarkably only between 76-78 from Philadelphia to New York City. What a difference. Lows will be as low as near 60 degrees throughout the region under clear skies and indeed drier air which will allow temps to fall away after dark tonight. With the western Dakotas enduring mid-90s and brutal sunshien this afternoon. as you head into Minnesota on south and east towards Chicago, it’s sunny, relatively low in humidity and highs are barely topping 75 degrees from MSP to CHI to Detroit… Lows are genenerally in the 50s and 60s! Like in the north as well as the south and eastern US, the air has been cleaned out considerably. Though there is a good chance of thunderstorms throughout Texas and Oklahoma today, highs are held in the mid to upper 80s from Houston to Amarillo, both as a result of moisture flowing up from Alex as well as the influennce of thr trough now drapped into the eastern US. Lows should be in the upper 70s near the coast to mid and even low 70s for most inland areas, some spots may be lucky enough to fall into the 60s tonight..
VIDEO: Hurricane Alex Approaching Mexico. 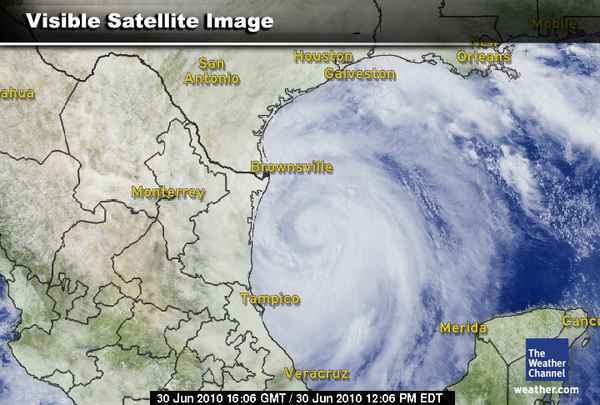 Brownsville Getting Hit! After lows in the upper 70s to low 80s from DC to Boston of recent days and highs well into the 90s. A cold front and behind it, a cooler, drier and more refreshing Canadian high has dropped well into the eastern half of the US, carving a much cleaning and easier to breathe air mass down as far south as Memphis and Atlanta and has pushed the Bermuda high way off the East Coast. This allowed highs to fall into the upper 70s to around 80, even down to DC and Baltimore, WHAT A CHANGE INDEED!! Lows? try 60s! wow. It will cool at night thanks to drier air, which cools better than moist air, moisture of course retains heat, so after mere 70s for highs from DC, Balt, Philly, NYC and Boston, lows may even fall into the 50s for Boston and New England with a potential for some 40s across interior New England, whilst low 60s for lows all the way to Virginia… Emjoy it whilst you can, this refreshing cooler air won’t last! 80s continue for southern England, 70s, cloud and mugginess hold across Scotland. Highs today and yesterday rose into the mid 70s here in Lennoxtown and throughout the central belt. Some sun shawn today but it remained cloudy yesterday, though it was cloudy it was warm and humid, making it feel subtropical indeed. The air is still of Azores origin, but Scotland and further north remain under the boundary between low pressure and a cool pocket off the NW coast and where warm, moist air continues to feed up from the south. 80s remain in control from Birmingham to London… This air will continue to hold up until the weekend! June 2010 is over and done with. The story of the Monsoon till end June is vague and haphazard. A stunted progress, and a completely distorted movement. The monsoon set in over Kerala on May 31 and reached Mumbai on 11 June. A day early, and a date late to the normal dates. It covered the northeastern states slightly earlier than the normal time, but reached Kolkata only on June 13, about a week later than normal. As of Tuesday, the monsoon has reached up to central and east India, as per the Monsoon limit line in the IMD map. Rainfall activity being reported from most of the areas covered are not too uniform, and are sporadic and scanty in the Gujarat region. (Shall put up the monsoon performance map/report till end June as soon as it is published by IMD). Maharashtra is still on the “pre-monsoon ” stage, with thundershowers developing, specially over North Mah. region, every afternoon,but pouring heavy rains in very isolated pockets, and clearing by the the morning. Sunnier further west across Ayrshire, where grasses are very brown and this is one of the driest areas of the country! It became cloudier as the day wore on but no rain fell..